Joel Winthrop is an expert in real estate valuation; traditionally, this means he assigns financial value to various types of real estate properties, ranging from residential to corporate to technological. He thrives on the most challenging valuation projects, such as large industrial complexes and a saw mill. These projects were all detailed on the gentleman’s résumé and in and of themselves would serve to propel his advanced career. However, Joel learned from his professional network that a major western university was seeking a program director for its Master of Real Estate Development program, which had some traction but was still very much in the growth phase. He knew he was right for the role and could elevate the program as its leader and as an expert in the field. 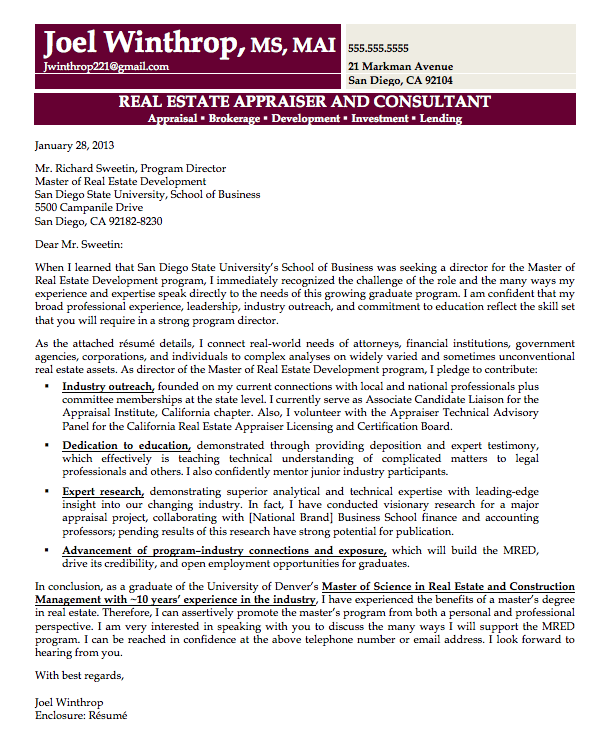 The challenge for me, and for Joel, was to explain in this cover letter how and why an expert in the business of real estate valuation would choose to grow into an academic role for a fledgling sub-department of a major university’s graduate school of business—and what he would do once he earned the privilege of leading the department. Ordinarily, a cover letter of this length might go unread, but we knew that in his application to this role, he’d be appealing to an academic colleague, so it was worth explaining in detail his contributions to his industry and exactly what he would contribute to the leadership of this division. Demonstrate his professional expertise, for which he already had a profoundly positive reputation in the region, particularly for his clear talent for valuation of nontraditional and complex real estate properties, such as a light rail, a recreational speedway, and a coal-fired power plant. Explain the parallels between his professional experience and the stated goals of the program, which we demonstrated in a clear and concise one-to-one correlation. Prove his commitment to an academic approach to an otherwise purely professional industry by reiterating his exceptional performance in the country’s top graduate program of the type to which he is applying to lead plus his current collaboration with known academic experts in the field. Joel earned the offer for the position on the strength of his résumé and cover letter, his professional reputation, and his undisputed expertise. He transitioned to the role in Q2 2013.